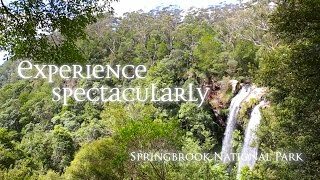 Spectacular waterfalls and cool ancient forests await you in the beautiful World Heritage-listed Gondwana rainforest of Springbrook National Park. High on the Springbrook Plateau, walk through fragrant forests of New England ash, ancient lepidozamias, colourful hakeas and dazzling wildflowers to this stunning waterfall on Purling Brook. There are 265 steps on this walk and it's easier to walk in a clockwise direction. If you've got time, take the two kilometre return track to the Warringa Pool.